On this first day of Spring, what can be better than getting kids outside into the spring sun and fresh air? Our Parachute provides an ideal way to spend some time outdoors, getting bodies in motion after a long, cold winter. The bright and colorful parachute has something for everyone: you can teach colors, turntaking, prepositions…Most of all, it’s plain old fun for all. 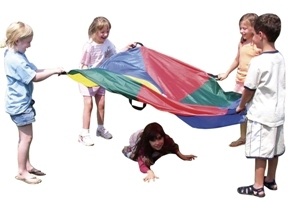 This week, save 15% on Parachute Play by entering the Promo Code BLOGPPS12 at checkout. *Offer expires on March 27, 2012 at 11:59 pm EST. Not compatible with any other offer. Be sure there are no spaces after the Promo Code when you enter it at checkout. Written by: Different Roads to Learning on March 20, 2012.on March 19, 2012. This entry was posted in Difflearn Promo Code, Pick of the Week, Playskills, Products, Sale by Different Roads to Learning. Bookmark the permalink.